CHICAGO (WLS) -- Cook County Board President Toni Preckwinkle questioned the timing of the Laquan McDonald police shooting video and called for structural change inside the Chicago Police Department. "Sixteen shots. Thirteen months. Why did it take 13 months when they had video camera footage of this incident to bring charges against the officer involved? Why did he have a desk job and get pay and benefits for a year as the state's attorney and the mayor attempted to suppress the evidence?" Preckwinkle said. Preckwinkle is one of several politicians questioning how Mayor Rahm Emanuel and Cook County State's Attorney Anita Alvarez handled the investigation and release of the police dash-cam video. Garry McCarthy was fired from his job as Chicago police superintendent earlier this week. Alvarez defended herself on Thursday. 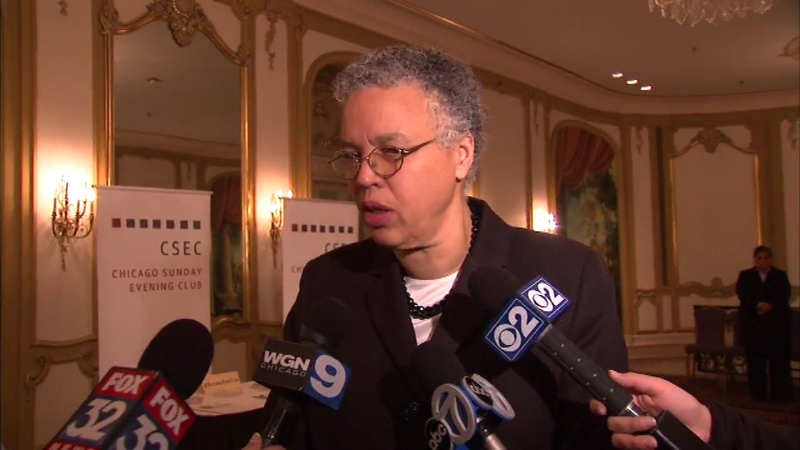 Preckwinkle spoke after 52nd annual Chicago Leadership Prayer Breakfast in downtown Chicago. Governor Bruce Rauner attended, along with other political and business leaders. "We have a crisis today of faith. We have a crisis today of morality in the institutions of our society. The most essential elements of restoring that faith is prayer, communication coming together as a people," Rauner said.